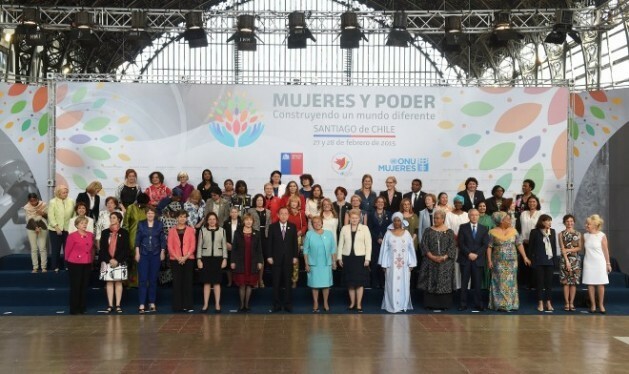 SANTIAGO, Mar 2 2015 (IPS) - Women’s participation in decision-making is highly beneficial and their role in designing and applying public policies has a positive impact on people’s lives, women leaders and experts from around the world stressed at a high-level meeting in the capital of Chile. “It is not about men against women, but there is evidence to show through research that when you have more women in public decision-making, you get policies that benefit women, children and families in general,” Winnie Byanyima, executive director of Oxfam International, told IPS. “So women tend, when they’re in parliament, for example, to promote women’s rights legislation. When women are in sufficient numbers in parliaments they also promote children’s rights and they tend to speak up more for the interests of communities, local communities, because of their close involvement in community life,” she added. 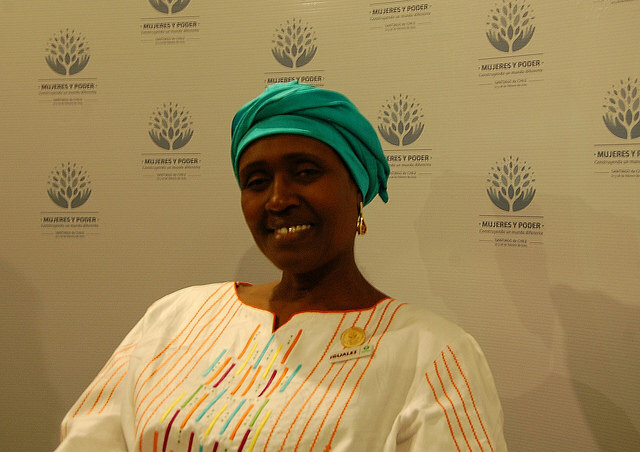 Byanyima, from Uganda, is one of the more than 60 women leaders and government officials who met Friday Feb. 27 and Saturday Feb. 28 at the meeting “Women in power and decision-making: Building a different world”, organised by U.N. Women and the Chilean government in Santiago. The conference was led by Chilean President Michelle Bachelet, who was the first executive director of U.N. Women (2010-2013), and her successor, Phumzile Mlambo-Ngcuka of South Africa. U.N. Secretary General Ban Ki-moon also took part in the inauguration of the event. The meeting kicked off the activities marking the 20th anniversary of the Fourth World Conference on Women, held in September 1995 in the Chinese capital, where 189 governments signed the Beijing Declaration and Platform for Action, which contained a package of measures to bolster gender equity and women’s empowerment. Two decades later, defenders of the human rights of women recognise that progress has been made, although they say it has been slower and more limited than what was promised in the action plan. In terms of women’s access to decision-making, representation remains low. In 1995, women accounted for 11.3 percent of the world’s legislators, and only the parliaments of Denmark, Finland, the Netherlands, Norway and Sweden had more than 30 percent women. And only three women were heads of state and seven were heads of government. Today, women represent 21.9 percent of parliamentarians globally, and 39 lower houses of Congress around the world are made up of at least 30 percent women. In addition, 10 women are heads of state and 15 are heads of government. In Latin America and the Caribbean, one of every four legislators is a woman, and in the last 23 years, six women were elected president of their countries, four of them in the last decade. And three of them were reelected. In March 2014 Bachelet took office for a second time, after her first term of president of Chile in 2006-2010. In Brazil, Dilma Rousseff began her second consecutive term on Jan. 1. And in Argentina, Cristina Fernández has been president since 2007, and was reelected in 2011. “Women in power and decision-making: Building a different world” was attended by a number of high-level women leaders, such as Lithuanian President Dalia Grybauskaité, First Deputy Prime Minister of Croatia Vesna Pusic, several vice presidents, and ministers from around the world. Speakers mentioned achievements as well as multiple political, cultural, social and economic barriers that continue to stand in the way of women’s access to positions of power. There are still countries that have not made progress, said Byanyima, of Oxfam, one of the world’s leading humanitarian organisations. Rivera, the founder of the Centre for Indigenous Peoples’ Cultures of Peru, said the progress made has been uneven for native and non-native women, while there are continuing gaps in education, participation, violence and economic empowerment. According to the Economic Commission for Latin America and the Caribbean (ECLAC), one of every two women in the region is outside the labour market, and one of every three does not have her own income, while only one of every 10 men is in that position. Another study by the United Nations regional body concluded that if women had the same access to employment as men, poverty would shrink between one and 14 percentage points in the countries of Latin America. “There is already enough evidence in the world to show the positive impact of women’s leadership,” said Mlambo-Ngcuka, who prior to heading U.N. Women served as South Africa’s first female vice president (2005-2008). “Women have successfully built and run countries and cities, economies and formidable institutions,” she added. But she said “We know that this is not happening enough, and we know that there can be both overt and subtle resistance to women’s leadership. We also know the devastating impact of leaving things as they are. We know that for women’s leadership to thrive, and for change to happen, all of us need greater courage and decisiveness. “According to available data, it will be some 50 years before gender parity is reached in politics. Unless political parties take bolder steps,” she said. Mlambo-Ngcuka recounted that during a Thursday Feb. 26 meeting with Chilean civil society representatives she called on a pregnant woman set to give birth in six weeks. According to the female leaders and experts meeting in Santiago, change cannot continue to be the sole responsibility of civil society groups that defend the rights of women, but requires action by the authorities and those in power – both men and women. “The heirs of Beijing are the heirs of voices that call on us and urge us to put equality on the political agenda,” said Alicia Bárcena of Mexico, the executive secretary of ECLAC. “Twenty years after the Beijing Declaration and Platform for Action, women know what is needed to reach gender equality. Now it is time to act,” she said. 50 years ahead its a long run ! we can get it shorter by counting more on “ordinary” women those who are not involved neither on political parties nor on high level decision making. GAD an association dealing with Governance and Development proposes to systematically set up a “women zone” (WZ) in each single community . The WZ is in charge of natural ressources inside the community territory management , health versus nutrition toward the more vulnerable population (children and pregnant women), Education and Poverty alleviation through Agricultural activities and all Food Security Value Chain. These women involved on WZ will push politicians, men as well as women to take into account women benefit . These women trough the WZ will take part of Governance in any in single area of the development of the community. the font is really small so i had to put my face closer to my monitor and now my eyes hurt. other than that its a very informative article.